This tasty, family-pleasing recipe doesn't take a lot of effort or ingredients. Using a large serrated knife, cut the spaghetti squash in half lengthwise. Use a spoon to scrape out and discard the seeds. Place all 4 squash halves, cut side down, on a large piece of parchment paper in the microwave. Cook on high power until just tender, 9 to 11 minutes. Meanwhile, heat broiler and lower the rack to the middle position of the oven. In a bowl, combine the cottage cheese, Romano and . tsp pepper; fold in the broccoli. Season the squash halves with . tsp each salt and pepper, then use a fork to scrape up most of the squash strands, leaving them in the squash. 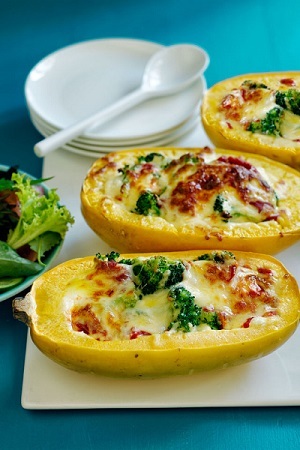 Divide the cheese mixture among the squash and top with the sauce, then the mozzarella. Broil until the filling is heated through and the top is golden brown, 2 to 3 minutes. Serve with a green salad, if desired.